Majority of therapeutic antibodies have been generated using monoclonal antibody technology. Therapeutic antibody is produced in engineered cell line. 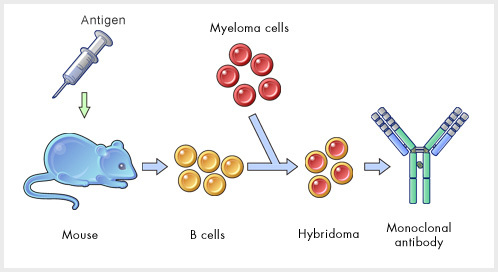 Monoclonal antibodies are prepared by fusing immortal myeloma cells with the spleen cells, B cells, derived from a mouse that has been immunized with the intended antigen to produce monoclonal antibody-producing cells, hybridomas. Hybridomas have the characteristics of the two different types of cells, and are able to both produce antibodies and reproduce infinitely.